All the major sights of interest of Trapani are concentrated in the historic quarter, and, in keeping with the luck we’d had so far on this trip, our wonderful hostel was also right in the heart, steps away from elegant baroque palazzi and stunning churches. I like to be very selective when putting in a plug and here I will pass the name along because it was really worth it: Albergo Messina. A little old man greeted us weary travellers when we arrived in the early morning. He wore a plaid bathrobe, his hair was sticking out in all directions, and, shuffling along in leather slippers, he brought us to his office to check us in. It had been quite a trial to make the reservation. From our hotel room in Palermo, we logged into Skype on the laptop. Armed with only a condensed translation section of our travel guide, we frantically leafed through the pages and barked out the occasional Italian word, speaking loudly and primitively into the monitor. We hoped desperately that the elderly gentleman on the other end understood us but we had absolutely no idea whatsoever if that was the case. No deposit, no confirmation nor credit card number was exchanged. He just asked for a name. Totally old school! We took a chance in going to this town with the hopes that a room would be held for us, for it was peak season after all. As it turned out, the pensione was lovely, kinda grandma-style, and a real insight into 1950s Italy. It shared a leafy courtyard with a more expensive B&B next door. We made a day trip to Erice, a medieval town situated 750m above sea level, on the mountain of Eryx. When the wind is low, you can take the funicular up/down the mountainside. The funicular’s schedule is not ‘cast in stone’ as the closely monitored weather can change at the drop of a hat. 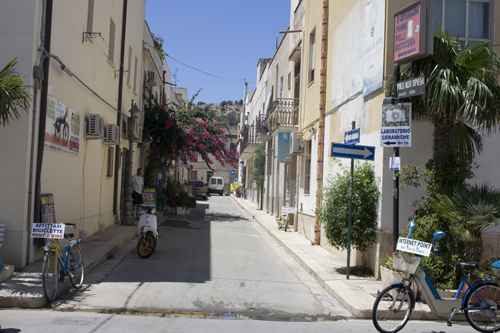 We took the bus up to the mountaintop and strolled through the town’s picturesque alleys and courtyards. In retrospect, it would have been cool to photograph Erice and its commanding views of the valley below either at sunrise or sunset, but we happened to go smack in midday. Seeing as we were there at lunchtime, I tried the staple pesto alla Trapanese (pesto made from fresh tomatoes, basil, garlic and almonds) with busiate, a small pasta that is hand-twirled in Trapani. I couldn’t possibly be one more day in Sicily and not have a cannoli so I bought one from a café run by Maria Grammatico, Sicily’s most famous pastry chef (excuse another plug). An especially alert reader might have picked up on a theme here: it is undeniable that a significant part of our trip revolved around food. If we’d had more time in Trapani, I would have loved to have taken a ferry to Tunis, due to its proximity to North Africa. 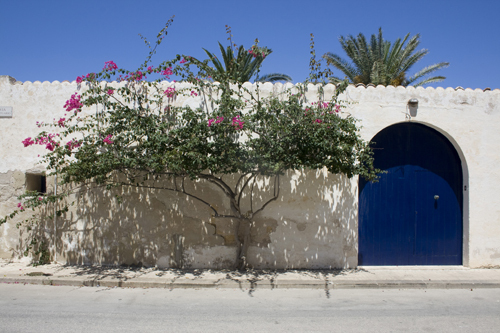 We certainly witnessed the Arab heritage of Sicily and Trapani is well positioned on the sea route to Tunisia. That’s ok, though. I’ve left something for next time. After 4 days in Palermo, we were ready for something else. Since we were ultimately to fly out of Trapani, we decided to go there next. 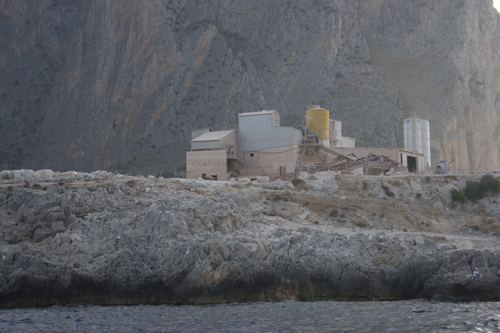 It was a good call to stay in Trapani for not only is it lovely itself, it’s an excellent base from which to explore the whole northwest of Sicily. 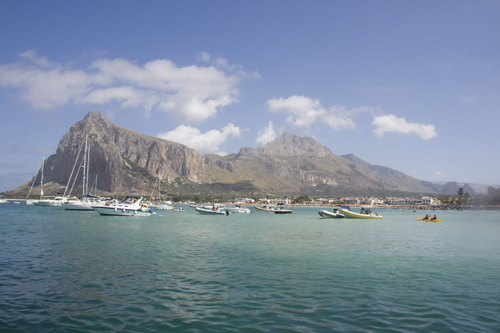 Upon recommendations, Elli and I set out on a day trip to visit the seaside town of San Vito lo Capo, cradled in a valley between impressive mountains with caves, and famous for its gem of a beach. 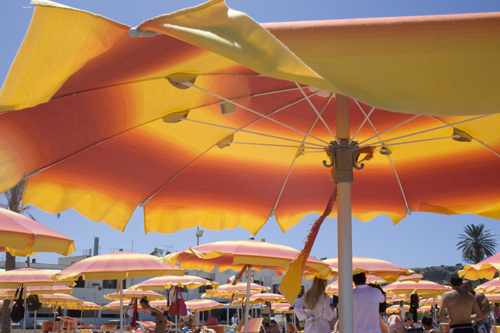 We relished in the warm breeze, the outdoor eateries, the tremendous sandal selection and the occasional men in bikini brief swimsuits strutting down the streets. Although the Tyrrhenian Sea was awash with tourists, I wasn’t deterred from jumping in and bobbing with the waves the first chance I got. In the afternoon, we took a 4-hour boat excursion to see the wild coastline of Riserva dello Zingaro, Italy’s first nature reserve. The park is best seen on foot, however the trails are long and we weren’t terribly keen on ’inspecting’ the flora nor unexpectedly coming face to face with the daunting local resident: the rare Bonelli eagle. As far as I was concerned, appreciating its tranquil hillsides was just as good from the comfort of the boat. Besides us two, our excursion companions were a large group of loud, friendly, generous Italians who took an instant liking to us. 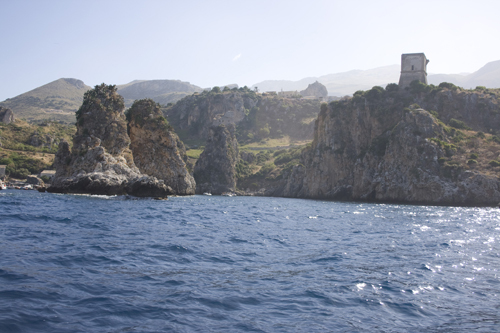 We stopped to swim in incredibly blue waters of the idyllic coves and bays of Scopello and Castellamare del Golfo. The coves are protected by rock towers jutting out of the sea. Half of the boat emptied itself into the water while the others remained onboard, watching and waving. Personally, I never miss an opportunity to swim because I’ve been a water-baby since day 1, or so my parents claim. Valeria, the friendliest of the tour group (and who stayed onboard), had offered to take pictures with my camera of us swimming. Not only that, to ensure that we got the most out of the experience, she tossed pieces of bread towards me and Elli, and hundreds of tiny silvery fish instantly swarmed around us, wiggling past to get to the crumbs. If the fish had been any bigger, I may very well have jumped out of my skin!